With the aim of providing access to indigenous culture to those who have not had the chance to explore the Cordilleran interior, the managing Chanum Foundation, Inc. started this artists’ village in 1998 with three salvaged authentic huts from Bangaan, Ifugao Province. Today, seven huts from Ifugao and Kalinga dot the mountain slope where a cool spring ripples under the gentle sunlight filtering through bamboo groves and pine tree rows. Some of these huts can be rented out for P900.00 a night (good for two). Breakfast, lunch and dinner are available, too. At the center of the village, there are art galleries and gift shops. Art shows and cultural performances are frequently exhibited in the village. 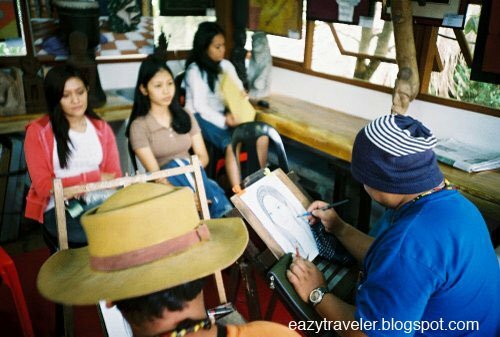 For P100, one can sit for 15 minutes or so for a portrait session with one of the in-house artists, an appropriate souvenir from one of the country’s art capitals. 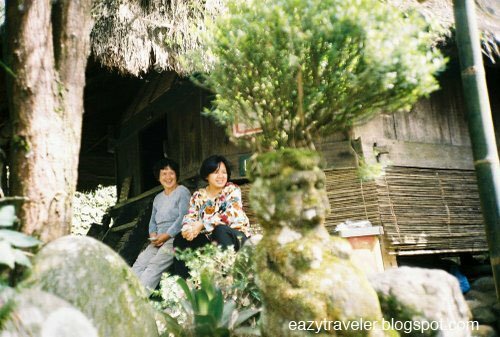 While the neighboring concrete houses visible as you ease your way up the village can be an eyesore and eliminate the suspension of disbelief, Tam-awan Village remains a tranquil hideaway of roughly hewn stone pathways, woodsy architecture and artsy enclaves. 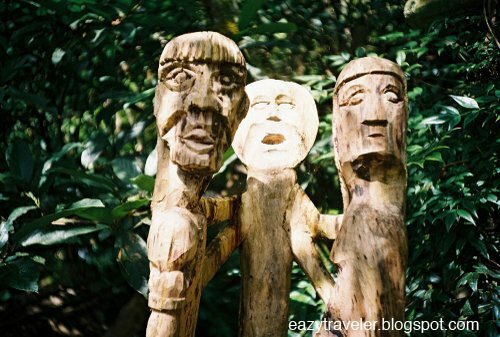 Tam-awan Village (+6374 4462949) is located at 366-C Pinsao Proper, Baguio City. To get here, one can hop on a Quezon Hill-Tam-awan jeepney (P8.00) along Kayang St. at the city market. Hail a taxi for a more convenient ride. More on transportation to and around Baguio City at my entry on Burnham Park. wow! the first photo is the one i like best. been to this place but you’ve captured it well.